During Memorial Day weekend, the Academic Team travelled to Atlanta, Georgia and competed in its first National Academic Quiz Tournaments (NAQT) High School National Championship Tournament (HSNCT). When the dust settled after a weekend of intense competition, Phoenixville finished 128th out of 256 teams. The team was led by junior captain Gina Vitale and included senior Aubrey Halloran, and juniors Ben Cushing, India Reiss, Kyle Kobilka, Savannah Mudd. Phoenixville’s results can be viewed here. The field featured teams from across the United States and Canada; Phoenixville even played against a team from China. View some sample questions here. Teams qualify for the tournament by finishing in the top 15% of the field in a regular season qualifying tournament. Phoenixville qualified in December at Centennial High School in Ellicott City, MD when the team finished 6th in a field of more than 40 teams. 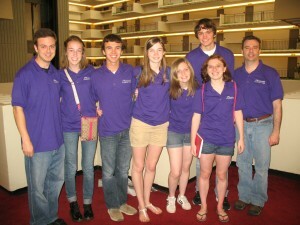 The team hopes to qualify for the HSNCT to be held in Chicago next June. With all four starters returning from last year’s team, they like their chances of not only returning, but finishing among the top 100 teams in the nation. They also hope to qualify two teams for the prestigious tournament. Click here to see the team’s 2013-14 schedule. You can help them achieve their dream by cheering them on this season, purchasing a candy bar from a team member, or playing in the PAHS Tournament of Knowledge.